(Photo: GettyImages)Advanced transportation technology increases the importance of airships for trade and economic development. 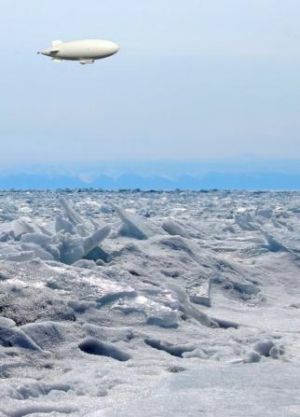 It is being defined that aircrafts able to fly the Polar Routes are the most competitive in northern areas without highly developed infrastructure. Nowadays, there are several types of airships suitable for Polar Routes, connecting directly Asia with North America. Four engine Boeing 747-400 is the major and most popular model to fly from North America to Asia over the Russian territory. Equipped with a two-crew glass cockpit and fuel efficient engines, a horizontal stabilizer fuel tank and revised fuselage can fly without a stopover for nearly 14,200 km. Alike a Boeing, the airbus ACJ is capable of using a variable number of additional fuel tankers which allows it to fly non-stop for more than 16,000 km which is more than could be made by another Arctic operating aircraft, Gulfstream G-V. The business jet can fly non-stop for not more than 11.000 km. High speed jet aircraft, bombardier with seating capacity for not more than 20 passengers, removable fuel tank in the tail and additional fuel tank in the wings, can fly straight from New York to Japan what makes it highly demanded trans-Arctic air shipping vessel. All the aircrafts provide high safety standards for crew and passengers. Less fuel stops cut down the time of journeys what makes the trans-Arctic travels even more attractive both for cargo vessels and private individuals. In the near future, British company will build a newest model of hybrid air vehicles to support Canadian North. The aircraft will use a mix of non-flammable helium and air power to fly and can land on almost any surface what means that it will able to supply northern communities and enterprises with various kinds of cargo of up to 50 tons. The plane will reach up to 200km/h in speed, what will highly influence northern economic development ran strain negative impact on Arctic environment.